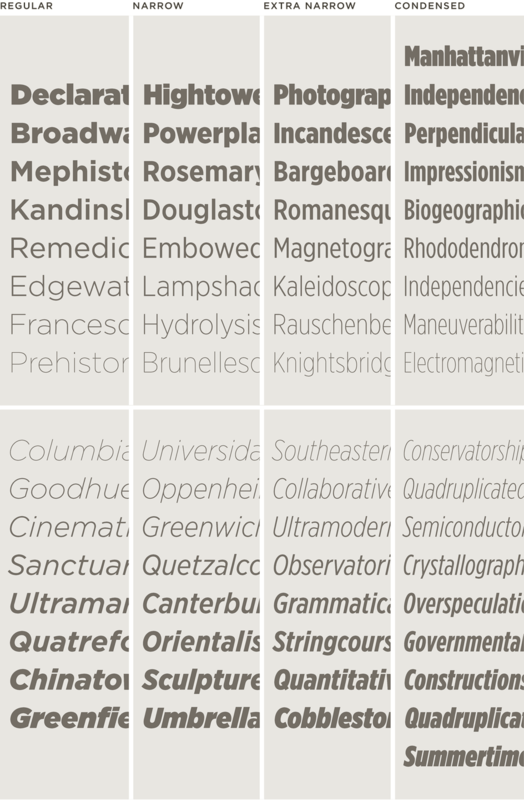 Gotham Font Features: Four Widths | Hoefler & Co.
First time visitor? Create an account. A Gotham for every occasion. A new addition: Gotham's expanded family now features four different widths, each in a full spectrum of weights — and each style comes paired with a matching italic. We've taken Gotham's iconic forms and played them out over a range of new weights and widths, to offer designers more options than ever before. The new Gotham Narrow preserves the straightforward geometries of the full-width Gotham, but is narrowed to allow tremendous savings in copyfitting — making Gotham Narrow an ideal choice for text. At the most compact end of the spectrum is Gotham Condensed, which we've expanded into a broader range of weights, from the refined Thin to a powerhouse trio for banner headlines, Black, Extra Black and Ultra. And between Gotham Narrow and Gotham Condensed is our new Gotham Extra Narrow collection, a compact family with a natural gait that’s perfect for headlines, book covers, product packaging, websites — anywhere that space is at a premium. Save an additional $100.00 for every two Gotham Bundles you buy! Four Widths. New additions: Gotham now includes four different widths, from regular to condensed, each style paired with a matching italic. Range. Without sacrificing its appeal at display sizes, Gotham has been crafted to flourish in text sizes as well. Voice. Friendly without being folksy, confident without being aloof, Gotham’s many moods run from hip to nostalgic to brash to eloquent. Numerics. For tables and charts, Gotham's core styles include a “Numeric” range that contains tabular figures, fractions, and extended symbols. Extended Language Support. All Gotham packages now include the Latin-X™, Greek, and Cyrillic-X™ character sets, together covering more than 200 languages worldwide. Your project exceeds the 1,000k limit, so your changes have not been saved. Try adding fewer fonts, fewer styles, or configuring the fonts with fewer features.